Neurotransmitters are chemicals located and released in the brain to allow an impulse from one nerve cell to pass to another nerve cell. There are approximately 50 neurotransmitters identified. There are billions of nerve cells located in the brain, which do not directly touch each other. Nerve cells communicate messages by secreting neurotransmitters. Neurotransmitters can excite or inhibit neurons (nerve cells). Some common neurotransmitters are acetylcholine, norepinephrine, dopamine, serotonin and gamma aminobutyric acid (GABA). Acetylcholine and norepinephrine are excitatory neurotransmitters while dopamine, serotonin, and GABA are inhibitory. Each neurotransmitter can directly or indirectly influence neurons in a specific portion of the brain, thereby affecting behavior. Neurotransmitters are chemicals that transmit messages from one nerve cell (neuron) to another. The nerve impulse travels from the first nerve cell through the axon—a single smooth body arising from the nerve cell— to the axon terminal and the synaptic knobs. Each synaptic knob communicates with a dendrite or cell body of another neuron, and the synaptic knobs contain neurovesicles that store and release neurotransmitters. 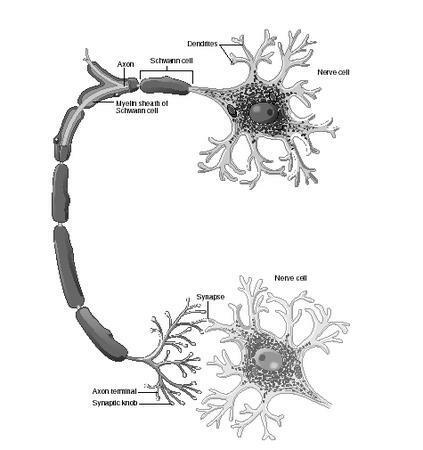 The synapse lies between the synaptic knob and the next cell. For the impulse to continue traveling across the synapse to reach the next cell, the synaptic knobs release the neurotransmitter into that space, and the next nerve cell is stimulated to pick up the impulse and continue it. in a structure called the postsynaptic membrane of another nearby neuron. Once the neurotransmitter is picked up by receptors in the postsynaptic membrane, the molecule is internalized in the neuron and the impulse continues. This process of nerve cell communication is extremely rapid. Once the neurotransmitter is released from the neurotransmitter vesicles of the presynaptic membrane, the normal movement of molecules should be directed to receptor sites located on the postsynaptic membrane. However, in certain disease states, the flow of the neurotransmitter is defective. For example, in depression, the flow of the inhibitory neurotransmitter serotonin is defective, and molecules flow back to their originating site (the presynaptic membrane) instead of to receptors on the postsynaptic membrane that will transmit the impulse to a nearby neuron. The mechanism of action and localization of neurotransmitters in the brain has provided valuable information concerning the cause of many mental disorders, including clinical depression and chemical dependency, and in researching medications that allow normal flow and movement of neurotransmitter molecules. Impairment of dopamine-containing neurons in the brain is implicated in schizophrenia , a mental disease marked by disturbances in thinking and emotional reactions. Medications that block dopamine receptors in the brain, such as chlorpromazine and clozapine , have been used to alleviate the symptoms and help patients return to a normal social setting. In depression, which afflicts about 3.5% of the population, there appears to be abnormal excess or inhibition of signals that control mood, thoughts, pain, and other sensations. Depression is treated with antidepressants that affect norepinephrine and serotonin in the brain. The antidepressants help correct the abnormal neurotransmitter activity. A newer drug, fluoxetine (Prozac), is a selective serotonin reuptake inhibitor (SSRI) that appears to establish the level of serotonin required to function at a normal level. As the name implies, the drug inhibits the re-uptake of serotonin neurotransmitter from synaptic gaps, thus increasing neurotransmitter action. In the brain, then, the increased serotonin activity alleviates depressive symptoms. Alzheimer's disease , which affects an estimated four million Americans, is characterized by memory loss and the eventual inability for self-care. The disease seems to be caused by a loss of cells that secrete acetylcholine in the basal forebrain (region of brain that is the control center for sensory and associative information processing and motor activities). Some medications to alleviate the symptoms have been developed, but presently there is no known treatment for the disease. People with generalized anxiety disorder (GAD) experience excessive worry that causes problems at work and in the maintenance of daily responsibilities. Evidence suggests that GAD involves several neurotransmitter systems in the brain, including norepinephrine and serotonin. People affected by attention-deficit/hyperactivity disorder (ADHD) experience difficulties in the areas of attention, overactivity, impulse control, and distractibility. Research shows that dopamine and norepinephrine imbalances are strongly implicated in causing ADHD. Substantial research evidence also suggests a correlation of neurotransmitter imbalance with disorders such as borderline personality disorders , schizotypal personality disorder , avoidant personality disorder , social phobia , histrionic personality disorder , and somatization disorder . Cocaine and crack cocaine are psychostimulants that affect neurons containing dopamine in the areas of the brain known as the limbic and frontal cortex. When cocaine is used, it generates a feeling of confidence and power. However, when large amounts are taken, people "crash" and suffer from physical and emotional exhaustion as well as depression. Opiates, such as heroin and morphine, appear to mimic naturally occurring peptide substances in the brain that act as neurotransmitters with opiate activity called endorphins. Natural endorphins of the brain act to kill pain, cause sensations of pleasure, and cause sleepiness. Endorphins released with extensive aerobic exercise, for example, are responsible for the "rush" that long-distance runners experience. It is believed that morphine and heroin combine with the endorphin receptors in the brain, resulting in reduced natural endorphin production. As a result, the drugs are needed to replace the naturally produced endorphins and addiction occurs. Attempts to counteract the effects of the drugs involve using medications that mimic them, such as nalorphine, naloxone, and naltrexone . Alcohol is one of the depressant drugs in widest use, and is believed to cause its effects by interacting with the GABA receptor. Initially anxiety is controlled, but greater amounts reduce muscle control and delay reaction time due to impaired thinking. Tasman, Allan, Kay Jerald, MD, Jeffrey A. Lieberman, MD, eds. Psychiatry. 1st ed. Philadelphia: W. B. Saunders Company, 1997. Can a brain return to normal functioning, if brain has somewhat sustained injuries from drug and/or alcohol addiction? As one that has been dealing with depression for many years there is one question I have always wondered about. How can a mental disorder cause physical problems or pain? This may seem a stupid question or I may over think it but just curious. How do we know what is "normal" behavior of these neurotransmitters as compared to what you have described as "being blocked" and re-absorbed by the originating nerve ending or staying in the synapse instead of moving to the next nerve cell ending etc. How do we know what each different individual's brain is supposed to behave like--aren't we all different and doesn't behavior affect how the brain works as well as the brain affecting behavior? Each person is so unique I find it difficult to believe one set of rules for neurotransmitter behavior fits all. What has research learned about the brain's ability to recover from serious damage from drug and alcohol abuse. In other words, has it been shown that the neurotransmitters can act and behave normally without medications after a period of recovery? And, what about adaption? People with even severe brain damage from accidents have been shown to "learn" skills lost on one side of the brain by adapting and learning to use the other side of the brain for those tasks. Can certain neurotransmitters "learn" to adapt to fit the intended specific targets despite not being able to perform correctly for periods of time? How does science explain "situational" depression for which the majority of humans experience from time to time and recover without the addition of chemical interventions. Are the neurotransmitters just "temporarily" not working right and automatically correct themselves in a matter of time? If so, why isn't that the case with other "disorders?" I would appreciate any information you may have available or at least direction to sources of info where I may find these answers. Can a blockage of taste to the brain be caused by neutransmitter?